Biopesticides International was started from June 2005 and is covering the field of biopesticides and various allied aspects, pure and applied, related to this field. Over the years both basic and applied experimental research on biopesticides relative to insects and plants has expanded, largely due to search for possibilities of integrated pest control, stimulated also by a growing awareness regarding environmental hazards of conventional chemical control. 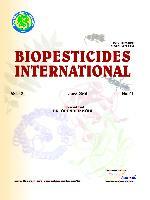 As new fields of research have opened up and new approaches established in biopesticide research, this specific journal of biopesticide sciences has an aim to place such studies in a single, relevant and organized form the “Biopesticides International” which has great appeal due to interdisciplinary content. The scope of the journal is broad in the sense that it publishes the latest developments in biopesticidal research based on natural sources like plants, microbes, fungi, predators and parasitoids and allied materials like bio-herbicides and entomopathogenic nematodes including diverse studies of entomological, toxicological, agricultural, biochemical, molecular and biotechnological nature related to biological pesticides. The journal also seeks to promote insect plant interaction studies and manipulation of plant genomes for in vivo production of pesticides that is gaining importance. The journal also has a mandate to include the titles related to governance of biopesticides and to publish papers that could cover issues that are in the realm of socio-political sciences, law and legal instruments, ethics, environmental impacts, etc. Reviews will be published regularly and by invitation only but we will welcome suggestions for timely topics and potential authors for reviews. Authors should submit a summary for consideration to the editor-in-chief before starting work on the manuscript. Each review should normally be no longer than 10 to 15 printed pages. Manuscripts may be submitted to the editor-in-chief or respective regional editors in USA, Canada, Japan, and UK. Only electronic submissions using Microsoft Word should be submitted as email attachments, with figures in power point as separate files. Submission of a paper will be taken to imply that it represents original work not previously published, that is not being considered elsewhere for publication, and that if accepted for publication, it will not be published elsewhere in the same form, in any language, without the consent of the editor-in-chief. It is a condition of acceptance by the editor-in-chief of a typescript for publication that the publishers automatically acquire the copyright of the manuscript. All papers should be in English. Papers should be typed double-spaced with 1-inch wide margins on all sides with full title, abstract, abbreviated title for running headlines (up to 35 characters), 4 to 6 keywords, references and figures. Except for reviews, each paper should be presented in the order of Abstract, Keywords, Introduction, Materials and Methods, Results, Discussion, Acknowledgements, References, Tables and Figure captions. References in the text should follow the Harvard style. The title page should include, in addition to the title, the surnames and initials of each author followed by his or her department, institution and address including postal code and country and email address. Please indicate the author for correspondence, whose telephone, fax and E-mail numbers should be included. The present address of authors should appear as a footnote if different. The title page should also indicate the number of manuscript pages, figures and tables, and show in the top right hand corner the name of the editor-in-chief or regional editor to whom the paper has been forwarded. Four to six keywords should be listed in alphabetical order at the bottom of the title page. This should be no more than 200 words in length, should summarize the significant findings and should not contain any references. Champagne, D.E., Koul, O., Isman, M.B., Towers G.H.N. and Scudder, G.G.E. (1992) Biological activity of limonoids from the rutales. Phytochemistry, 31, 377-394. Simmonds, M.S.J. and Blaney, W.M. (1992) Labiatae-insect interactions : Effect of Labiatae-derived compounds on insect behaviour. In R.M. Harley and T. Reynolds (eds. ), Advances in Labiatae Science, Kew : Royal Botanic Gardens, pp. 375-392. Sukh Dev and Koul, O. (1997) Insecticides of Natural Origin, Harwood Academic Publishers, The Netherlands, 365 pp. All figures should be numbered with consecutive Arabic numbers, have descriptive legends, and be mentioned in the text. Keep figures separate from the text, but indicate an approximate position for each figure in the margin. The quality of line drawings and photographs must be of high enough standard for direct reproduction. Photographs intended for halftone reproductions must be good glossy original prints of maximum contrast. A list of figure legends with relevant figure numbers be typed on a separate sheet and included with the typescript. Tables should be consecutively numbered with arabic numbers and have a clear descriptive title at the top. Explanatory table footnotes (designated by superscript lower case letters) typed below the table are acceptable. Use of abbreviations should be as per the Systeme Internationale symbols. The corresponding author will receive proofs (including copies of figures) by airmail or email attachment for correction, and these must be returned to the printer within 48 hours of receipt. Please ensure that a full postal address, telephone number and E-mail, if available, are given on the first page of the manuscript, so that proofs are not delayed in the post. Authors alterations in excess of 10% of the original composition cost will be charged to authors. The corresponding author will receive a PDF file of his paper for non-commercial use, which can be used to print out copies for co-authors and for any requests authors may receive from interested readers (terms and conditions will follow along with the file). However, hard copies of reprints can be ordered on payment basis when page proofs are received by the authors. There are no page charges to individuals or institution for publishing their papers. However journal subscription charges per volume should be sent to Koul Research Foundation by Demand Draft payable at Jalandhar, India.